A focus on dental care in senior citizens is just as important as it is for children. Indeed, oral health in your later years can be a major factor in your quality of life. For one, aging effects on other parts of the body can make dental care more challenging. Some hygiene tasks once performed easily become harder — arthritis, for example, or loss of muscle strength may make it difficult to hold a toothbrush or floss. In such cases, you may need to find new ways to make the task easier: a power toothbrush with a larger handle; pre-loaded floss holders or a water flosser; or adaptations to a manual brush to make it easier to hold, like attaching a tennis ball or bike handle. 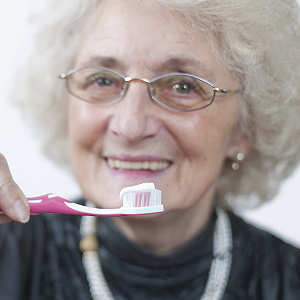 Other age-related conditions — and their treatments — can negatively impact oral health. Less saliva production, which is a consequence of aging or certain drugs, increases the risk of tooth decay or periodontal (gum) disease. Older adults often develop gastric reflux problems that can introduce tooth enamel-eroding stomach acid into the mouth. And medications called bisphosphonates, often prescribed to treat osteoporosis, may interfere in rare cases with bone healing after tooth extraction or similar procedures. Prior dental work can also prove challenging to treating dental disease. It becomes more difficult to preserve teeth threatened with decay if there are significant restorations or appliances to work around. Pain perception can also diminish with age, so that dental disease may not be noticed until later stages when significant damage has already occurred. Oral care requires more attention as we grow older, or as we care for older family members. Your best defense against disease is to continue regular six-month visits with us. In addition to normal cleanings and checkups, we’ll also screen for oral cancer (a more prevalent occurrence in older adults), review your prescriptions or other supplements and medications for any possible side effects to oral health, check the fit of any dentures or other restorations and evaluate the effectiveness of your hygiene. While other age-related conditions may capture the majority of your attention, you shouldn’t allow that to neglect your dental care. With your continued efforts, along with our support and your family’s, you can continue to enjoy good oral health throughout your lifetime. If you would like more information on dental care for senior adults, please contact us or schedule an appointment for a consultation.